Contragenesis is a very ugly thing, tangled and unsettled, as well as suffocatingly heavy. As with much of the best extreme metal, its gurgling, snorting delivery masks a visceral artistry. It might well be one of the finest death metal albums of 2012. Influences are definitely “old school”, but not in a revivalist sense. The inspirations seem to be the pioneering likes of Incantation, Immolation and Morbid Angel, making heavy use of the weirdly-shaped but keenly inventive riffs that you’d find on Onwards to Golgotha, Close to a World Below or maybe even Gateways to Annihilation. Here, snarling death metal is ruptured by squelching, gaseous sludge riffing; what the band lacks with regard to a sense of volume dynamics is more than amply compensated by the morbid deftness with which the songwriting oozes and squirts from one horrible idea to another. Dissonant and chaotic guitar textures whirr and whine, and like with the above-mentioned Immolation the slower tempos are not about groove, but rather about conjuring the imposing weight of a heaving electric sea. Contragenesis is, as I have said, a complex release, and it rewards repeated listens. Tracks often veer from breakneck quasi-blackened assaults into something darker and stickier, like a rhino wading into a swamp. The queasy, disjointed lead guitar lines add to this sense. They don’t surface often, but when they do, like on Pyroclastic Downfall, they assume a drunken, spindly form, like pestilential retches. Sometimes, the influence of more slamming death metal seems clear, as with the comparatively conventional slow grooving of Hierophant. But at other times, like on lengthy closer The Final Cadence to Bloodshed everything becomes surreally oppressive. Its creeping, crawling opening feels like the slower numbers on Gateways to Annihilation, but the song treks on for a dark and sinuous seven minutes through dank passages that remind me of Welsh blackened doom lords Ghast, and lurching death riffs. 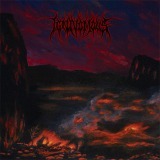 This is a distinctively vile vision of death metal, and one which I would advise anyone to hunt down.